Coming up live via the web or on BBC Radio 4 on Christmas Eve ~ this year’s programme is available here. “A Festival of Nine Lessons and Carols is broadcast live on BBC Radio 4 on 24 December at 3pm (10:00 EST or 07:00 PST). The service is also broadcast at 2pm on Radio 3 on Christmas Day, and at various times on the BBC World Service. 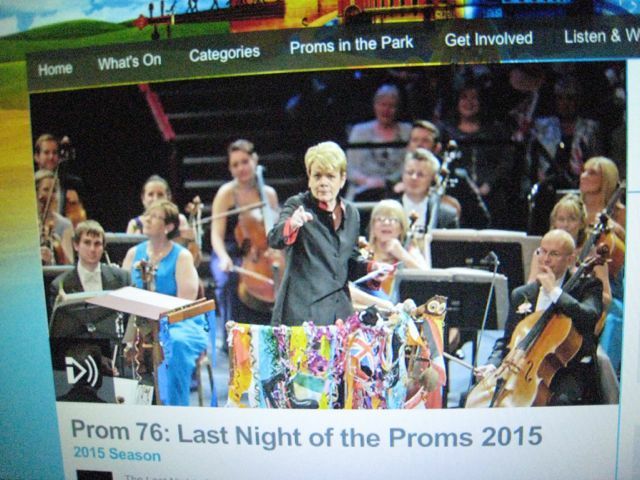 For several years I’ve made a point of listening to the Last Night of the Proms. Whilst drinking tea & dunking digestives, I listen on-line. This year I thought I’d also sew, but got too involved in listening. I always sing along at the end, thus my copy of “Jerusalem” (above). There are some video clips of various performers here and here. I’d heard both the tenor and the mezzo many times a few years ago, and was interested to hear how their voices were aging. Both sounded good. Voices change as their owners grow mentally and physically. They also tell immediately if the singer is under stress. Even women’s voices change, particularly if they have children, as Ms. de Niese did recently. Her voice seems to have darkened slightly, having more heft to it, but she’s kept the agility. Herr Kaufmann’s tenor is also perhaps a bit darker, and his top notes are maturing nicely. During an intermission interview, we learnt he’s just added the famous aria from Turandot, “Nessun dorma” to his repertoire. Voices are more stubborn than mules. If you think you’re going to do something your voice isn’t mature enough for, or the right type of voice, you will have problems. A voice can’t take much stress before it starts going haywire! It can develop wobbles, loose agility, lose top and/or bottom notes, develop nodes, or become permanently disabled. When your voice is your career, you need to understand how to care for it wisely.